This Special Edition Giveaway is by the Heart of Texas Arts & Crafts Show. 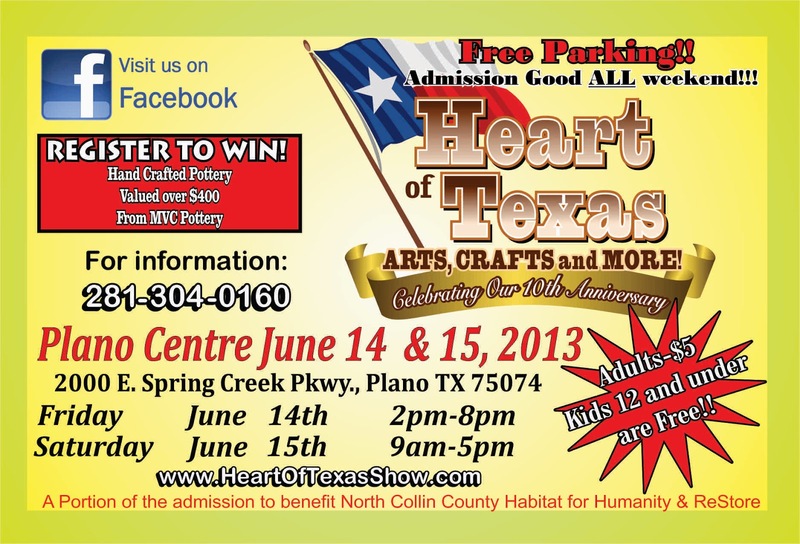 Join the Heart of Texas Arts & Crafts Show to celebrate the 10th anniversary season at their third annual Father's Day weekend show! Vendors from all over Texas and surrounding states offer a variety of merchandise to sell including woodwork, metal art, handcrafted jewelry, wood inlay masterpieces, tile mosaics, handsewn quilts, pottery, wreaths, paintings, food and so much more! They are expecting over 2,000 people over 2 days. How to enter: Simply leave a comment here and tell us what your ideal Father's Day plan for your dad would be. For a BONUS entry, share this giveaway on Facebook or Twitter (tag us!) and comment again below to let us know. Please don't forget to leave an email address, if I cannot contact you then you cannot collect your prize! Facebook entries can no longer be accepted. Contest ends at 10:00PM on Tuesday, May 28th, 2012. 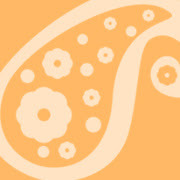 Winners will be announced Wednesday, May 29th, 2012. Entries open to the US only. I want to take the time to thank everyone who took the time to enter, especially those for whom Father's Day is a bittersweet occasion. I felt your struggle on Mother's Day myself, and I will be thinking of you this Father's Day. Big strong hugs to you all, I hope your weekend is wonderful. Congrats, Michelle Hay Critz, you have WON a 10 X 10 booth space at the Heart of Texas Arts & Crafts Show on June 14th and 15th in Plano. The first time vendor addendum fee will also be waived. The vendor will need to pay for extras like electricity, tables, a corner premium, and / or their own travel. Pipe and drape backdrop along with chairs will be provided. "The big top is here, Lots to do at the carnival see the arts and craft dealers, or just grab a bite and take a ride on our Ferris Wheel, We have openings for food and craft vendors on this 11 day Extravaganza, No matter if your looking for fun or just shopping How Bazzar says 'We've got what you want! Come enjoy fun for the whole family!'" "This is an annual event in Waxahachie where people tour historical homes and visit historically recognized buildings such as the newly restored Ellis County Courthouse, the Ellis County Museum, Sims Library, Ellis County Art Museum. People can also view vintage automobiles parked around the downtown square. There is an arts and crafts fair in Getzendaner Park with children's activities, live music, and refreshments." Admission Fee: The Arts and Craft fair is free. To tour the historical homes, the rate is $15 for adults and $7 for children ages 5-12. If the tickets are purchased prior to May 24, there is a $3 discount on adult tickets and a $2 discount on children tickets. To receive this special offer call 1-972-937-0681 with Visa/MasterCard. "We will be hosting a HANDMADE Craft Fair at Buffalo Creek Baptist Church in Waxahachie, TX. " "Peace, Hope, & Butterflies, hosted by Miracle Players Foundation, is a family friendly music/art festival and butterfly release that raises funds for childhood cancer research at Children's Medical Center Dallas. 100% of money raised at the event will go directly to funding research. The event will feature live music, art vendors, food trucks, children's activities (petting zoo, bounce slide, face painting, pirate ship, obstacle course, arts and crafts, and more), and will culminate with the release of 500 butterflies in honor of children fighting cancer." Event tickets are $10 for children and $15 for adults, all access. 100% of ticket price will go directly to funding childhood cancer research at Children's Medical Center Dallas. "We will be having a fundraising event for the Hemiplegic Migraine Foundation. 5K and Kid's fest. 200-300 vendors, well marketed event, spaces are only $35, (only $10 if you donate to the silent auction!). This is an outdoor event." Know of an event we are missing? Email us at dfwcraftshows(at)gmail(dot)com with the subject "Weekend Event" and we will get it added ASAP! "Mark your calendars! The Falls Gift & Trade Show will be June 15th at the Wichita Falls MPEC! Join us for a fun summer shopping event featuring local craftsman and home businesses! Enjoy door prizes, vendor raffles and more! The first 50 shoppers will receive a free goodie bag stuffed with free samples and special offers!" Booths are 10 X 10 and cost $65. This fee includes a draped booth, 8 foot table, chairs, electricity, and a contribution toward our door prizes. In addition, all vendors must contribute to the 50 free goodie bags with either a sample or coupon depending on what works best for your business. Prices are cooperative and expenses have been shared equally among all vendors, no promoter profit. Applications are available here and are due by June 1st, 2013. For more information, visit their website or contact their event coordinator at fallstradeshow2013@gmail.com. "2nd Annual Craft Fair. We offer numerous hand crafted items for sale by lots of different vendors. Some examples: Scrolled wood crosses, ceramic bird feeders. handcrafted jewelry and beaded items, lighted wine bottles and cork trivets." Outside vendors available. Provide your own set-up & tent. Vendors provide their own tables and chairs. 8' table maybe rented for an additional $10.00 charge to be paid in advance. If electricity is required (inside or out) there will be a $10.00 charge to be paid in advance. Vendors supply their own extension cords. Applications are available here and are due by September 15th, 2013. For more information, visit their website or contact their event coordinator at shannonmurphy0148@att.net. "St. Jude Catholic Women Organization is once again hosting their annual Jewel and Junk Trunk Sale. This is an Outdoor Show only. No electricity will be available." "The City of Farmers Branch will have an Arts & Crafts Marketplace during their annual Liberty Fest on Saturday, May 25th from 12 (noon) – 9:00 pm. Liberty Fest will include many additional activities including all day Country Music Entertainment, a FREE Kidzone and a paid The Zone area for children, Burgers & Brews sampling area, an American Fallen Soldiers presentation, and Food & Beverage sales, including beer and wine. This is a FREE, ticketed event. Stop by city locations to pick up free tickets beginning April 1st." "Moms on Main Car Show! From 10am to 3pm." "First Stop to Holiday Shop!! Kettle Corn, Bounce House, Face Painting, 40+ Craft Booths, Concessions, Door Prizes, A Great Atmosphere For Shopping and Fun." On the Corner of California Lane and Bowen Rd. **Electricity is limited and offered on a first come, first serve basis. Tables available for $5. Chairs will be provided at no charge. They will be selling concessions and all vendors will receive ½ off at the concession area. Applications are available here and are due by August 28th, 2013. For more information, visit their website or contact their event coordinator at bazaar@woodschapel.org or Debi at 817-480-3667. You may contact the church at 817-275-2308. "This is a benefit vendor fair for Grace Fellowship. (a local church) Their will be 50 to 60 vendors all different. Shop, have a booth or just come have fun." Booths require a $20 donation. Bring own tables, chairs, or tents if you would like. To apply, please email jesgowens89@gmail.com. "Adult Co-ed softball tournament benefiting Colette Goss in her battle against cancer (cholangiocarcinoma). It doesn't matter how good/bad you play, this is a day to have fun and enjoy the beautiful weather. $200 entry fee per team. Due by Sat. June 8, unless otherwise directed. We will have concessions (food, drinks, etc.) Available. T-shirt available for pre-order." $200 entry fee per team. Due by Sat. June 8, unless otherwise directed. Booth space sizes have not been determined. First come first serve. Has limited space under pavilion. No electric available. Other space is going to be made available in parking area. Set up is $25.00. Please bring your own canopy, chairs and tables. Applications are available here and are due by May 31st, 2013. For more information, visit their website or contact their event coordinator at Shirley Gage (903) 905-2996 / Facebook (preferred) / paparazzibyshirley@gmail.com. For event info, you can also contact Kendall Dickerson (469) 525-5750 or Facebook (preferred). "Our dear friend Colette has been diagnosed with Cholangiocarsinoma stage 4 Liver cancer. She is a single mom with 2 small beautiful girls. At this time she isn't able to work. We are putting this together to help with all her needs during this time until she can return to work." There are a few picnic tables attached the floor under The Onion Shed. All others will need a canopy, table & chairs. Applications are available here and are due by June 15th, 2013. For more information, visit their website or contact their event coordinator at paparazzibyshirley@gmail.com. Snacks, lots of prizes, beauty treatments, and more!" For a very limited time, tickets are Free! See website below! Option 1: Vendor brings in one and only 1 small table (card table size. Maximum booth size is 4x4ft. $100. Not available after 5/30/13. Option 4: Vendor brings in own tables/racks. Approximate booth space is 8x8. No tables over 6 ft long. max of 3 tables/displays/racks. $150. Electricity is $10 extra. Table cloths/coverings are NOT included, please bring your own. Parking is Free. Each vendor must help spread the word, and must provide a prize valued over $20. I need mailing address to send receipt and postcards. Each vendor must LIKE the FB vendor page. No sharing booths. See facebook page for already confirmed vendors BEFORE inquiries. They are working on having dinner provided for vendors, or appetizers, stay tuned. There will at least be light apps. Vendors get all the perks that guests get, such as: beauty treatments, prize drawings, snacks, drinks. Applications are available here and are due by June 1st, 2013. Please see application for cancellation and refund information. For more information, visit their website or contact their event coordinator at sipshopswag@yahoo.com. "An outdoor event where local vendors gather to sell their handmade, repurposed and vintage items, as well as photography and artwork. Come find unique gifts or lovely items for your home or office! Find items such as furniture, soap, jewelry, table linens, photo blocks, birdhouses, outdoor furniture, wood creations and hand sewn children's clothing and stuffed animals, just to name a few." Admission fee is $2 and 2 canned goods per car. $3 with no canned goods. "The Deep Ellum Outdoor Market's mission is 1) to inspire a walkable community in Dallas, and 2) to promote small business and entrepreneurs. We allow vendors who make their own products or those who sell vintage apparel and accessories." "VFW Tradedays houses 32 vendors third Saturday of Every month. Outside Vendors also welcome. Advertising each event is done in local paper for entire month as well as Road Signs throughout the Corsicana Area." "Cedars Sunday is a hip local market where vendors sell fresh farm products, handmade goods, and quality personal and home products directly to the Cedars Art District neighborhood. " "COME! Bring the whole family to this powerful event, and leave changed for good! It is the first of its kind, and there is something for everyone, including a whole area with activities for the kids! The day will open at Noon with Aztec Dancers! The Closing Ceremony will open at 6 pm with Taiko Drummers, followed by the band ZionaurA, led by Jet Tessman!" Tickets DISCOUNTED if purchased IN ADVANCE on our website! "How Bazzar is an indoor vendor market open every weekend throughout the year. 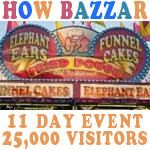 Each weekend How Bazzar has a specific National Sponsor that will set up for an event to draw customers to the site. This could range from Ford, Kawasaki, Yamha, Chevrolet, Kabotta or John Deer. How Bazzar offers their adopt a pet program the second weekend each month. We work with local rescues to assist in their adoption process. Each third weekend we sponsor our Monthly Auto Show featuring 100's of classics and Hotrod displays. How Bazzar always has live music or local DJ talent entertaining our guests throughout the weekend on the patio. You'll even see Carter Blood Centers In April featuring the Bazzar blood drive. We have hundreds of vendors with new ones each week." "Join the Heart of Texas Arts & Crafts Show as they celebrate their 10th anniversary season at their 10th annual fall show! 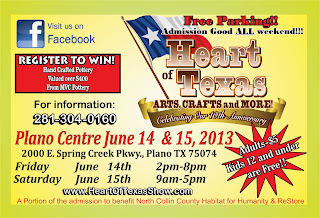 Enjoy browsing arts & crafts inside with lovely air conditioning at the Plano Centre. Vendors from all over Texas and surrounding states offer a variety of merchandise to sell including woodwork, metal art, handcrafted jewelry, wood inlay masterpieces, tile mosaics, handsewn quilts, pottery, wreaths, paintings, food and so much more!" 2000 E. Spring Creek Pkwy. This fee includes Pipe & drape backdrop and chairs. For more information, visit their website or contact their event coordinator at vendorinfo@shoppingseasons.com / 281.304.0160. "Every second Saturday of each month, we have a big flea market at Lee Harvey's. This is a monthly urban flea market of eclectic art, antiques, vintage, kitsch, collectibles, handmade jewelery & wares, books, prints, furniture, toys, and odd finds." "Funky Junk Round Up is a one day shopping extravaganza featuring an eclectic blend of handmade items * vintage & antique decor * glam & jewels along with creative junktiques! Grab your friends and load your trunk with some funky junk!" "Second Saturday Biergarten Bazaar beginning in February 2013! Shop antiques, crafts, vintage items, art and furniture at this unique outdoor event in the Jones/Butler Biergarten in Historic Meadowbrook (East FW). Street parking and outdoor restrooms are available. Watch the Jones/Butler Biergarten Facebook page for details! Next Second Saturday Biergarten Bazaar is February 9, 2013." "Celebrate Mother’s Day weekend @ Aqua~Fit with the Entire Family to Receive an Important Safety Course &. Jump on the World’s Safest Trampoline all for FREE!" "Women Who Dare to Win is about a woman's Beauty, Inside Out! It's Fun, Motivational & Educational with Professional & Entrepreneurial Women modeling the season's look, accessories and colors, showcases of fabulous products and services that enriches the lives of women, a motivational keynote and interactive seminars! During the inspirational half day event, women and their BFF will be celebrated for their beauty from the inside out, their journeys, and, accomplishments. Dallas professional, entrepreneurial and small business owner women will strut for the cause as they model the season's look, colors, and, accessories. Women are invited to bring their BFF, share the experience, join the gal pal forum at the event and celebrate the power of friendships. While this event is for professional and entrepreneurial women, it supports a worthy cause. Professional & Entrepreneurial Women will be strutting for the cause the event benefits: Helping mothers and their teen daughters have healthy relationships, and, thereby reduce teen Pregnancy (Dallas is #1 in the nation for repeat teen pregnancy)." Admission is $20 (Benefiting Real Beauty Inside Out Healthy Mother Daughter Relationships). Booths are 9 X 18, a parking space, for $25. A double space is $45. Applications are available here and are due by May 23rd, 2013. For more information, contact their event coordinator at bonnirod@yahoo.com / 817-683-8227. If there is no answer, please leave a message. 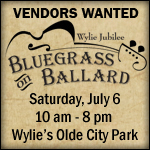 "The Wylie Downtown Merchants Association in conjunction with the City of Wylie present the Wylie Jublilee Bluegrass on Ballard in historic downtown Wylie, featuring music, arts and crafts in Olde City Park, a chili cook-off, and car show. " Booths are 10 X 10 and cost $50. Please provide canopy, table and chairs. Applications are available here and are due by June 21st, 2013. For more information, visit their website or contact their event coordinator at carole.ehrlich@wylietexas.gov / 972-516-6020.